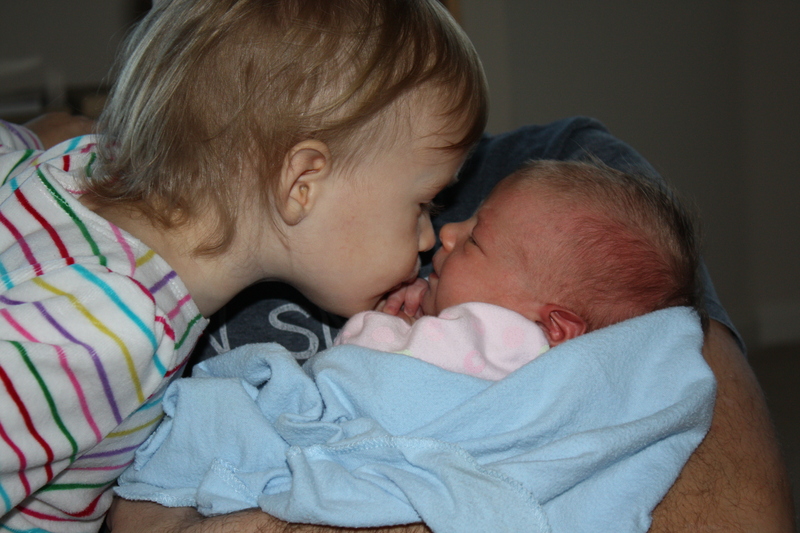 I don’t know why it’s taken me so long to write about Felicity’s birth. Maybe I’ve just gotten lazier about writing over the years. Maybe. But I think it has more to do with how the birth actually went. I think I simply couldn’t bear to face the facts of my second birth. Not that anything terrible happened, but the whole experience was somewhat miserable until Felicity was actually born. And I expected more of a homebirth. But after that birth I was thinking that I actually enjoyed laboring in a hospital with Natalie more than at home with Felicity, and that was hard to swallow. And almost impossible to admit, even to myself. As I think about it, I think it had much to do with the midwife’s attitude and not as much to do with the labor process itself. The most I’ve told anyone about my labor is that it was longer and harder than Natalie’s, and that I didn’t get to push how I wanted. As much as I don’t want to relive that labor, I don’t want to forget. So, 18 months later, here is the story of Felicity’s birth. I wasn’t very healthy while pregnant. We lived on the third floor in the city, and had to drive somewhere else in order to get in a decent walk. So, living up three flights of stairs with a toddler, combined with the effort required in order to actually be outside, made exercise difficult. I’m sure eating a Culver’s snack pack meal a couple times a week didn’t help in the health department, either. David was working crazy long hours, so to pass the time I’d eat. I think that had a lot to do with making the labor so difficult. Anyway, Tuesday night I was having strong contractions, after having mild ones steadily all day. For some reason the main thing I remember about that day was that Natalie and I went to Costco to stock up, and I was thinking I may be in labor. What a mundane thing to do the day labor begins. I called Sally*, the midwife, that night and told her, but said it probably wasn’t the real deal and I was going to bed to try to get some sleep. That was 9pm. Around 11pm I woke up wanting Sally there, and woke up David. He convinced me to wait a little while and to walk around so he could time the contractions. We walked around the apartment, and the contractions were close, but kind of inconsistent. I was feeling nervous and unsure about whether I was in labor or not. Finally, David called Sally around 2am, and she showed up an hour later. Because I was so unsure I wanted her to check me to make sure all the contractions were actually doing something. She did, and I was four centimeters. So, she said my body is working, but that I shouldn’t wear myself out by walking around since my body will do the work no matter what. I knew that walking around would speed up labor and help the baby get in a better position, but I was tired and felt a little insecure about speaking up since I was new to homebirth. So David and I cuddled up on the bed and waited. He fell asleep, I dozed on and off between contractions. Sally and Michelle, her assistant who came to watch Natalie, slept in the livingroom. Later I got really uncomfortable and so got in the tub (the wonderful, huge, garden tub! ), but didn’t stay too long. It was starting to get light when I started feeling like I wanted to push. Everything before then was kind of a blur. I knelt on the bed, held onto David, and pushed, but it was taking a little while. I felt self-conscious in the daylight. Then Sally asked if I was sure I actually needed to push. She checked me and said that there was a tiny lip of skin still blocking the baby’s head, so that I couldn’t need to push yet. She made a comment about how moms who’ve ever given birth in a hospital don’t know how to push. I got upset with her, although I didn’t say a word, because that was totally untrue. When I felt the urge to push last time, I pushed and out came a baby. No one was telling me when to push. I listened to my body. This time, I felt insecure and uncertain about the entire thing, and I felt like Sally was treating me like I didn’t know my own body just because I’d given birth in a hospital before. And then she made assumptions based on that, without the facts of how that labor actually went. Around this time, Natalie woke up and came in to see us. She was sweet, and wanted to see how I was doing…frequently. However, I was having a rough time with her coming in and touching me during contractions. I was distracted, upset with Sally, uncomfortable about being in labor in the daylight, without the night to embrace and protect me. I felt exposed and alone. Finally I escaped to the bathroom with David, and Sally and Michelle stayed in the livingroom and Michelle played with Natalie. That’s when I started to feel safe again. I sat on the toilet and felt like I didn’t want to do this ever again. I felt sick and over it. I almost looked at David and told him no more kids. I vaguely remember Sally coming to check and David telling her we’d be ready for the birth stool soon. She left to get it out of the car. Then I felt a sudden urge to push. I actually gave in a couple times and pushed before realizing what I was doing and reaching down to feel what was happening. And there was a baby’s head! I could feel her hair. I kind of gasped and exclaimed, I’m pushing! David called for Sally, and she immediately came in and said lets move her to the bed. I told her I wanted to stay there, but Sally didn’t listen and moved me anyway. Apparently I wasn’t adamant enough. David later told me that when she moved me our baby’s head went back up inside. I kneeled next to the bed and held on to the blankets while I pushed. It was terrible. I felt like I was in a bad position, but knew I wouldn’t be able to hold a squat long enough and Sally hadn’t brought the birth stool in. I was frustrated and upset, and as a vent screamed each time I pushed. Poor Natalie got really worried and came running in. She saw me screaming and started crying. David held her and explained what was happening, but at the end she got scared and ran out of the room. I pushed for what seemed like a really long time. Finally I felt the baby’s head come down, and I gave a huge push and her head came out. Then I pushed out her body and suddenly she was in my hands as Sally handed her to me. Here’s your baby. Felicity Noelle was born February 2010, at 9:37am. She was 6 lbs 12 oz, and had a black baby mohawk that stayed with her for the first year of her life. *I changed the names of the midwife and her assistant for their privacy. We used this particular midwife because our insurance covered most of her fees. Moral of the the story is: find a midwife you “click” with, even if she may cost a little more than one who’s just “okay.” It is so worth it to have a great midwife you feel comfortable with!